Green, Roland J., and John F. Carr. Great Kings' War . Ace 1985. Series note: A series of sequels to the original w88 android, by H. Beam Piper, q.v., which was a novel-length Paratime story. 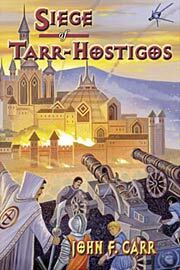 Includes Carr and Green's Great Kings' War , Carr's Kalvan Kingmaker , Carr's Siege of Tarr-Hostigos , Carr's The Fireseed Wars , and Carr's Gunpowder God . Summary: In their first attack on Lord (now King) Kalvan, Styphon's House hits him with three forces, but is defeated in all cases. 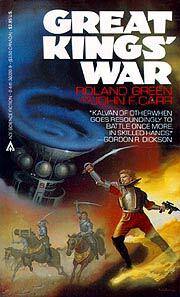 Series note: First sequel to H. Beam Piper's Lord Kalvan of Otherwhen , q.v. Published: Ace 1985 (0441302009BUY), as by Green and Carr. — Revised edition, as by Green and Carr, posted on-line at Baen Free Library, Oct. 1, 2004. — Revised and expanded edition, as by Carr and Green, Pequod 2006 (0937912034BUY). Carr, John F. Kalvan Kingmaker . Pequod 2004. Summary: Styphon's House drives barbarians from the North American plains east into Kalvan's territory in order to destroy him, but he turns the tables on them. 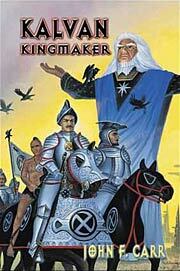 Series note: Second sequel to H. Beam Piper's Lord Kalvan of Otherwhen , q.v., following after Great Kings' War . — Expanded from "Kalvan Kingmaker", as by Carr and Roland J. Green, in Alternatives (eds. Robert Adams and Pamela Crippen Adams), q.v. Carr, John F. Siege of Tarr-Hostigos . Pequod 2004. Summary: Lord Kalvan loses his citadel to the forces of Styphon's House. Series note: Third sequel to H. Beam Piper's Lord Kalvan of Otherwhen , q.v. Published: Pequod 2004 (0937912026BUY), rev. 2012. — Expanded from "Siege at Tarr-Hostigos", as by Roland J. Green and Carr, in There Will Be War 8: Armageddon (eds. Jerry Pournelle and John F. Carr), Tor 1989 (0812549651BUY). Series note: Fourth sequel to H. Beam Piper's Lord Kalvan of Otherwhen , q.v. Publication note: Known during development by various titles, including Queen Rylla's Crown , Queens Rylla's Victory , and Queen Rylla's Throne . May have briefly been called Gunpowder God ; if so, that title was later re-applied to the next book in the series. Series note: Fifth sequel to H. Beam Piper's Lord Kalvan of Otherwhen , q.v. Publication note: Note that "Gunpowder God" was the title of the novella which made up the first half of Lord Kalvan of Otherwhen , q.v., and which was used as the title for one British edition of Lord Kalvan .